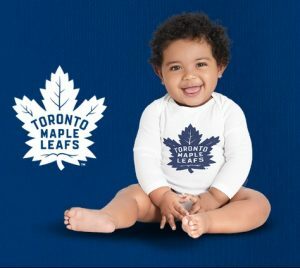 In commemoration of the Toronto Maple Leafs 100th Anniversary, Carter’s | OshKosh is giving away size 6 months limited edition Lil’ Leafs Bodysuits for FREE. Fill out the form to receive your free Lil’ Leafs Bodysuit certificate. Print and present your certificate in store to receive your Lil’ Leafs Bodysuit. Limit 1 Lil’ Leafs Bodysuit per customer and only valid at select stores in Ontario.